If there’s anything the Obama administration can and should do is be bold on matters of jobs and an even newer vision for economic equity. For sure a bold approach will anger people on both sides of the equation. When politicians get in campaign mode, they get a little bolder. They start naming names. They may start pulling back on a couple of messaging points too. “Jobs” (and I’m not talking about a surname but it fits the bill) doesn’t seem to be one of those back offs, at least for now. In fact, it’s more of the political measuring stick with the potential to be a slippery slope for Republicans on the domestic front. Or more like the story of Brer Rabbit and the tar baby. In 2008 the Obama camp went all out to win and found themselves in a situation in which they are not only bringing mops and buckets to clean up the messes of the previous tenant, but to manage interests in the old (idealistic dreams of a simplistic past that never really existed) in a world that’s dramatically changed in the last 20 or even 10 years economically, socially, demographically. “Jobs” have a simplistic one syllable ring in the social landscape. But not so simple in the new economy. “Made in America” has mean more than just a political talking point. Made to last, Made better, Innovative would be selling points for the consumer who doesn’t have the disposable cash to buy better, buy more, or buy to replace. What does obsolete mean to people who are already implementing their own “austerity” plans? Selling the new trade agreement means assuring Americans that this does not outsource more industrial jobs. However, a few trends loom. As we become more global, workers will become more mobile, that includes U.S. workers. One can look simply at a Hollywood trend, i.e. the recent “Karate Kid.” I will always consider the (Will and Jada Pinkett) Smiths’ version a very important film on this topic. Kobe Bryant and various b-ball inspired nations trying to finagle a deal during the NBA lockout. This is why we shouldn’t be too quick to condemn immigration. Americans may find themselves in the same boat, trunk, or cargo (not the same kind from the good ole days I hope). What will jobs mean as more blue collar labor becomes “titanium collar” (robotics). Can we get along with machines? Who better to clean up the radioactive mess when the earth decides to roll over in bed? Another trend – Made in the U.S. may = cheap labor. Recently, I reviewed two IT contracts. One from India, the other from the U.S. The rates in India were higher. Why is this? Maybe it isn’t a question of why, but “when.” It was bound to happen. Call centers have been outsourced to the Philippines AND the U.S. But wait, Ikea even European nations are outsourcing to the U.S. I seriously doubt you will see the union label on these products. Is that the Republican job plan? To bring jobs into the U.S. where labor will be is cheap. Where unions have limited or no power. Where the middle class economy is so pitiful that people will take what they can get for any pay. Is this what the troops are looking forward to when they begin returning from Iraq at the end of the year? Is this why Republicans shoot down the president’s job bill before it reaches the floor? There’s always a kickback for cheap labor in someone’s pocket. Monday, Walter Isaacson’s biography of the late great Apples genius Steve Job will be rolling off the prin–…uh downloaded onto iPads and (dare I say Kindles and other devices) around the world. According to the book, Steve Jobs was not impressed with his meeting with the president because of his focus on what why “things can’t get done” vs. what is possible. One would take that as yet another criticism of Barack Obama’s pragmatism, cautious, incremental, or “weak” approach to governing. But how does a producing visionary think? According to a recent article, Steve Jobs told President Obama he was heading for a one-term presidency if he didn’t adopt a more “business friendly” policy…. Could the jobs bill be the “briar patch” Obama has been waiting for? Many moons ago, I had this wish to go to New York and have Andy Warhol do my portrait. It never happened and I’m sure there are apps that can give one a Warholic hue. 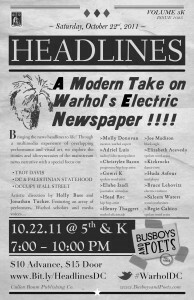 Friends at Busboys and Poets have collaborated with the recent National Gallery retrospective of Warhol’s “Headlines” work in what’s call WARHOL OFF THE MALL. 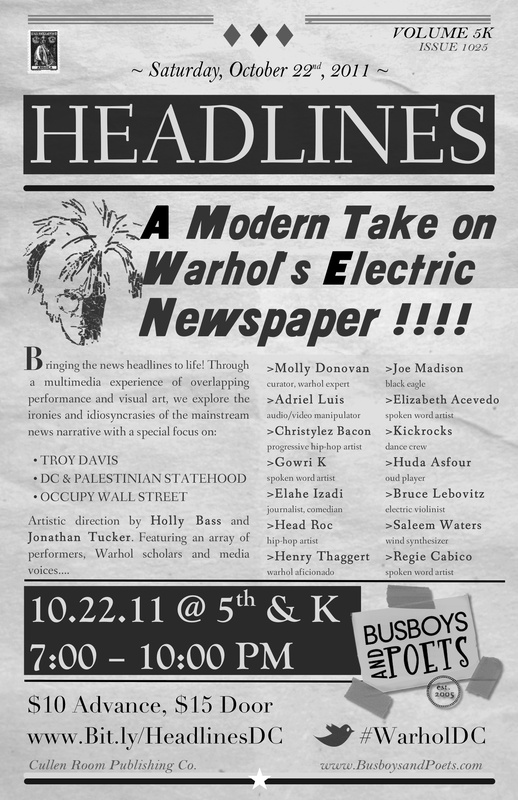 This Saturday, Busboys and Poets hosts a performance event, Electric Newspaper, 7 PM at the 5th & K, NW location. Also this weekend, I’ve got two ITVS Community Cinema events of DEAF JAM back-to-back. FREE with reservation – visit www.communitycinema-dc.org for Eventbrite links and additional information. ABOUT: Filmmaker Judy Lieff’s DEAf JAM, the story of deaf teen Aneta Brodski’s bold journey into the spoken word slam scene. Longing to explore and fully participate in the hearing world, Aneta dives into ASL poetry, a vibrant three-dimensional art form where body movements convey meaning. ASL poetry liberates a deaf poet from the confines of spoken language. There is no paper or text. Rhymes are measured in hand shapes and meter in movements. Images cut and dissolve as its verses transcend all spoken word. Artist line up: Quest Visual Theatre, spoken word poet and rapper Connell Crooms aka Bam Bam, and choreographer, actor, dancer Fred Beam. Film is open captioned; ASL interpretation will be available. Sometimes I have to remind myself of the power of thinking different for the common good, and some of us designed our lives around it. “Think Different” was one of my favorite Apple campaigns. 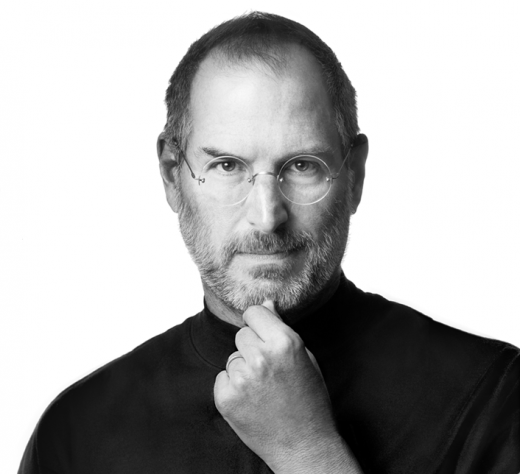 I didn’t follow Steve Jobs as a personality like some people follow George Clooney. Or maybe I followed Jobs the way Clooney fans follow his latest arm candy; in Job’s case, it was the latest Apple gadget. I’m typing this on my iMac now. Jobs’s set the bar not for computers but for his product. Apple became it’s own opponent, and a worthy one at that. I’ve had discussions about artists who reach a point where the only person they have to top is him/herself. There’s no looking in the rearview mirror anymore. It can be scary place when it comes to product, but Jobs made that theory work. And the world was never the same. Some people are determined to live to see specific outcomes. In 2008 I remember overhearing elders say they were holding on to vote in an historic election. Rev. Fred Shuttlesworth took the beatings, the bombings, and the blows until the perpetrator, legal segregation, finally fell to its knees. 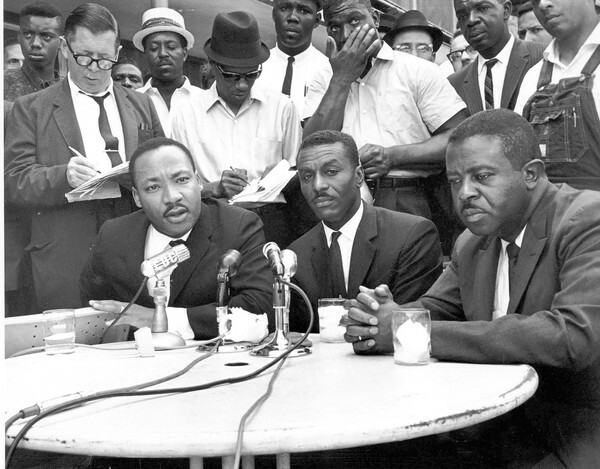 One thing they don’t teach about the civil rights movement is how subversive people like Shuttleworth were in the eyes of both white and black people of the times. Why stir the pot? But these were different kind of “Mad Men.” And the saga continues. Yes, I did hear a tree fall in the forest when news came that Wangari Maathai had died from cancer. Who would’ve thought planting trees was subversive, protest, liberating. Wangari Maathai thought different. We’ll all breath better for it. Years ago I read Derrick Bell’s Ethical Ambition: Living a Life of Meaning and Worth. Something was definitely on this legal mind at the time. If our goal is greater than ourselves, our own comfort or gain, and we continue to strive for it, then as feminist leaders proclaimed, failure becomes impossible. Even the end of an individual life is no proof of failure, if others share your goals and continue to work toward them.